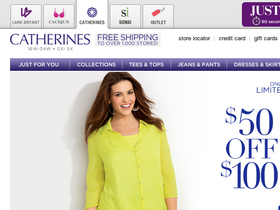 Catherine's, online at Catherines.com, is your online resource for plus-size clothing. Catherine's sells bras, shape wear, hosiery, robes, sleepwear, and undergarments. At Catherine's, you can also find tops, pants, shrugs, skirts, jeans, capris, dresses, and skirts. You can also shop from the Wedding Collection at Catherine's as well as find evening dresses and career dresses. In addition, there are handbags, wallets, jewelry, laptops, hats, belts, scarves, wraps, sandals, and sunglasses on sale at Catherine's. RetailSteal.com has the best Catherine's coupon codes, Catherine's discounts, Catherine's coupons, and Catherine's promo codes. Shipping and handling rates at Catherine's depend on the price of your purchase and your shipping destination. Free shipping is offered to Catherine's store locations. See website for full details. Exclusions may apply. Click the link to shop at Catherine's today and save 60% on original prices, and 40% savings in clearance. Use coupon code. Shop at Catherine's and save 30% on full-priced new arrivals using this coupon code. Click here to shop. Enjoy a $10 discount on your entire order from Catherine's when you use this coupon code online. Use code on orders of $25+ to qualify. Shop online at Catherines.com and enjoy free shipping to your local store. Click link to start shopping. Click link to shop the clearance section at Catherine's and enjoy up to 70% off a wide range of apparel and accessories. Enjoy savings up to 70% on apparel on sale at Catherine's. Click here to shop and save.